YEKATERINBURG, Russia, July 12 (Xinhua) -- Basking in a close political relationship, China and Russia are gearing up for broader economic and trade ties that will benefit both countries. The readiness of officials and business people for trade and investment was demonstrated by the fruitful fifth China-Russia Expo that concluded in the Russian industrial city of Yekaterinburg on Thursday. The three-day event attracted more than 200 Chinese and Russian enterprises, which displayed products and technologies in aerospace and aviation, equipment and machinery, among other areas. "The event was significant for cementing and strengthening bilateral economic and trade relations as well as expanding practical cooperation between local governments," said Li Hui, Chinese ambassador to Russia. China Tiesiju Civil Engineering Group (CTCE), a state-owned construction enterprise, is upbeat about the prospects of participating in Russia's large-scale infrastructure upgrading projects. 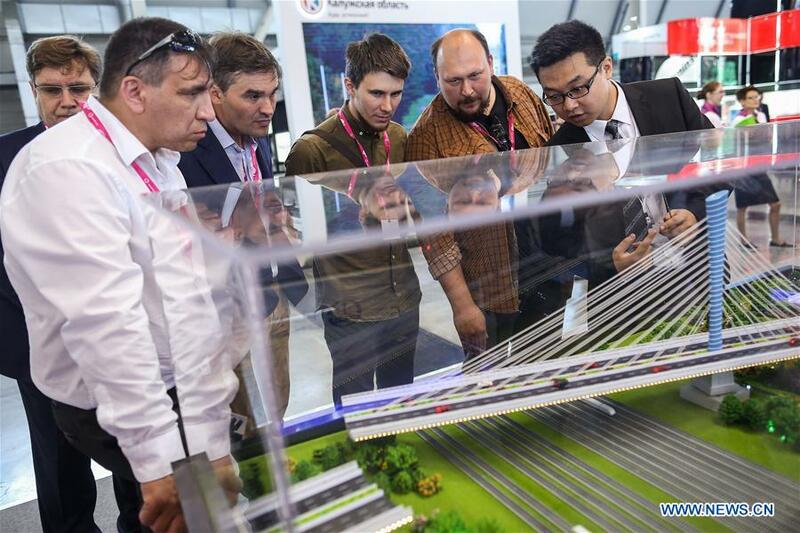 CTCE board chairman Zhang Hechuan said at the expo that Russians were impressed by China's achievements in high-speed railway design and construction. Survey and design for China-funded high-speed railway linking Moscow and Kazan are underway, Zhang said, adding that China has a mature, advanced and economical solution. China's rolling-stock maker CRRC Corporation, the world's largest railway equipment supplier, showcased scale models of its bullet trains at the expo. Zhang Guangquan, a marketing manager of a CRRC subsidiary, said Chinese bullet trains will operate normally in Russia's harsh winter as their capabilities have been proven in China's similarly cold northeastern provinces. Changan Automobile Company, a Chinese car manufacturer, established a plant in Russia's Lipetsk region at the end of 2016. "Although we do not have a big market share in Russia, the growth is rather rapid. Operating revenue was about 2 billion rubles (32 million U.S. dollars) last year. We expect a 20-percent increase this year," said Tan Peng, general manager of Changan's Russian branch. Delegations from 23 federal subjects of Russia participated in the expo. Andrei Pereskokov, minister of industry of Russia's Kirov Region, said government officials of his region have visited various exhibitions in China to seek business opportunities. He said Kirov is ready to offer tax breaks to attract investors in deep processing of timber and manufacturing of high-tech civilian products. "We will be very glad to have joint projects with Chinese partners. We are discussing various projects. I think at least some of them will turn into concrete working projects that will benefit both Chinese partners and Kirov," Pereskokov said. China's leading home appliance maker Haier began building an industrial park in Russia's Republic of Tatarstan in May. It plans to invest 1 billion dollars and set up production lines for washing machines, refrigerators, water heaters and TV sets. "We very much hope that other Chinese investors will come after Haier. We are waiting for them. Their potential is well known," said Igor Sapunov, deputy head of Tatarstan's Investment Development Agency. "Trade between China and Russia will possibly explode in the coming 10 years," said Liu Shaobo, CEO of transportation company Longyun Group in China's northeastern Heilongjiang province that borders Russia. Facing disputes with Western countries, Russia may increase imports of machinery and electronic products from China, which needs Russia's energy, grain and timber, said Liu, whose company entered the Russian market in 2005. Chinese and Russian economies are highly complementary and transportation routes, once upgraded, will make logistics between the two neighbors more efficient, he said. "The potential of Russian-Chinese inter-regional and cross-border cooperation is not used to the full," said Azer Talybov, Russia's deputy minister of economic development. Russian regions are interested in fostering cooperation with Chinese partners in sectors such as electricity, oil, agriculture, textile, food, tourism, machine building and housing construction, he said. Last year, Chinese direct investment in Russia surged 72 percent to reach 2.22 billion dollars, while bilateral trade value grew 20.8 percent to 84 billion dollars. In the first four months of 2018, bilateral trade increased 27.3 percent, the highest rate among those between China and its major trading partners. Russia has become China's ninth largest trading partner, up from the 11th place last year. Bilateral trade will possibly exceed 100 billion dollars by the end of the year. In May, China and the Eurasia Economic Union, which groups Russia, Kazakhstan, Belarus, Armenia and Kyrgyzstan, signed an agreement to simplify procedures of customs clearance and cut costs of trade in goods. In addition to traditional sectors, China and Russia are cultivating new growth areas, including the development of the Russian Far East and the Arctic, digital economy and cross-border e-commerce, said Gao Feng, spokesperson for the Chinese Ministry of Commerce. The two countries have set up cooperation mechanisms to coordinate the development in regions along China's Yangtze River and Russia's Volga River, as well as China's northeast region and the Russian Far East. A total of 137 pairs of sister cities or regions have been established. "China and Russia have entered an important period for their national development and rejuvenation. With highly compatible development programs, regional cooperation is very promising," Chinese Vice Minister of Commerce Gao Yan said.